M/S FATOS is new in our fleet! 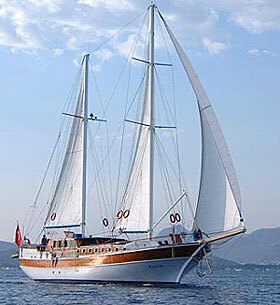 Step aboard the beautiful traditional wooden Ketch gulet ‘Fatos’, the best-budget vessel in our fleet and you’ll notice there’s nothing ‘budget’ about the holiday yachting experience with Blue Cruise Bodrum. This vessel was specially designed for the charter requirements. It features air-condition throughout, accommodation for up to 16 guests in four double cabins and four cabins with double + one twin beds each with ensuite shower and "hometype" toilet. All cabins with portholes, wardrobe, drawer, mirror. She comes fully equipped with VHF radio, GSM telephone, dinghy with outboard, stereo music system, windsurf, canoe, fishing and snorkeling equipment, generator and continuous hot water. There is an extensive, roomy galley to rival that of fine hotels, complete with all accessories and household appliances including connecting clothes washer and dryer facilities. With a length of 25 metres M/S FATOS offers enormous space on and below deck. (Captain, two deckshands and chef) in separate crew quarters. International cuisine, with the emphasis on Turkish dishes, is prepared deliciously in the well-equipped modern galley by our excellent onboard chef. Provisioning : Full-Board including Breakfast, Lunch, 5 o`clock Tee or Coffee, Dinner will be provided for 28 Euro per Person / per day. Beverages will be provided at your wishes according to supermarket prices. There is nearly none of the gullet charter-companies who tells you the truth about the use of air-condition on Gullets. Yes, M/S FATOS has AC and you think you can switch it on when you like. It's not! On a boat the AC can only run when the generator is on, or in a harbor when connected to 220 Volt. But mainly you are in anchor bays, often next to a neighbor who doesn't like the noise of your generator and you wouldn't like it either during the night for example. The M/S FATOS meets international safety regulations including life jackets, fire extinguishers and alarms.